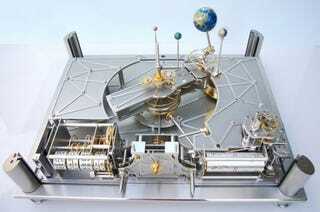 Looking like something Doc would own in Back to the Future, Richard Mille's Planetarium-Tellurium clock is a beautifully intricate device, able to provide extremely accurate details about the workings of our Solar System. The clock provides not only the exact positions of the Earth, Venus, Mercury, the Sun and the Moon (who needs the other planets, anyway?) but the current axis of the Earth, its position relative to the Sun, the rotation of the Moon, and even the current signs of the Zodiac.